After insisting he would ignore Team Fedor Emelianenko’s request for an immediate rematch against Fabricio Werdum, conspiracy theorists suggested Strikeforce CEO Scott Coker was favoring the highly anticipated scrap between the Russian and champion Alistair Overeem. The hypothesis goes; Coker is banking on Emelianenko violently bouncing back from his one-fight losing skid to capture the Strikeforce heavyweight crown. Thus, kicking in a “champion’s clause” – which is a component in mixed martial arts contracts that makes it difficult for an athlete to exit a promotion once he wins a title. Emelianenko only has one bout remaining on his current deal with the San Jose, CA based promotion. “That’s not it at all,” Coker told Sherdog.com. “Depending on if there’s any future fights, if he fights Overeem, it might not be a title fight. It doesn’t have to be (for the title). If Fedor is on his last fight with us, we wouldn’t make it a title fight with Alistair. IF M-1 Global actually accepts a fight against Ubereem, it’s highly unlikely they would risk their meal ticket’s longest career losing streak without having any hardware on the line. Furthermore, if an extension isn’t reached before Fedor’s next assignment is announced, it could be a good indicator that the free agent market may soon be flipped upside-down. 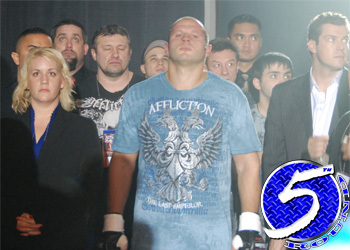 According to the report, Strikeforce has “first rights to negotiate” should Team Fedor seek out other offers. If this were the NBA, Emelianenko would be a restricted free agent. However, this is the fight game where the best deal will receive access to his services, regardless of what order the offer comes in. (A) Protect his legacy by chasing the Werdum rematch with Strikeforce. (B) End his Strikeforce tenure with a bang against whoever, then take his talents to South Beach – ahem, the UFC – to face the planet’s best 265-pounders on the biggest possible stage.